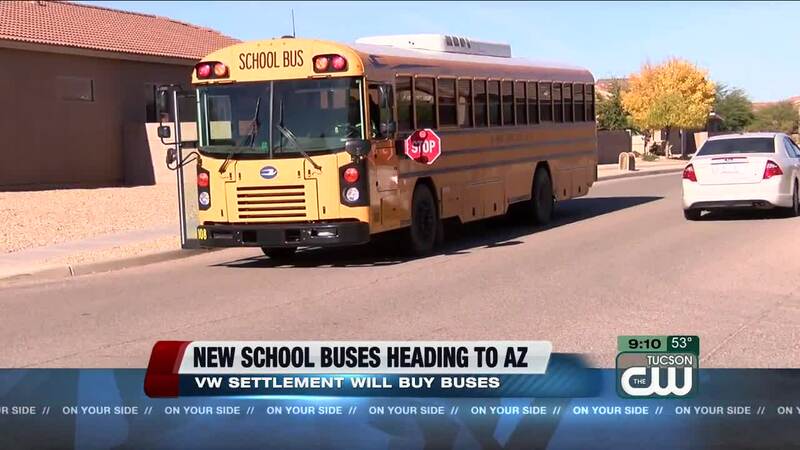 More than 50 school districts across Arizona will buy new school buses using cash from a lawsuit settlement with automaker Volkswagen. PHOENIX (AP) - More than 50 school districts across Arizona will buy new school buses using cash from a lawsuit settlement with automaker Volkswagen. The spending announced Thursday by Gov. Doug Ducey give 55 districts and charter schools nearly $16 million to purchase 142 diesel or alternative fuel buses. Another $16 million for buses will be awarded soon. According to the governor's office , San Simon, Nogales, Flowing Wells and Douglas school districts will buy buses with the settlement. Arizona school districts have seen transportation and maintenance budgets plummet due to the Great Recession and many buses are worn out. Ducey said in a statement that finding innovative ways to boost school spending will continue to be a priority. Volkswagen settled a federal lawsuit over an emissions cheating scandal two years ago. Arizona was awarded $57 million and earmarked $38 million for buses and rest for wildland fire crews and Department of Transportation equipment.